Millrock Reporter - Freeze Dryer Batch Reporting | Millrock Technology Inc. The Millrock Reporter offers freeze dryer batch reporting that you can customize to your own needs. All of the process data is collected and stored in an unalterable file format. Data is collected and stored for all process parameters, both set points and read outs, in the freeze drying cycle. 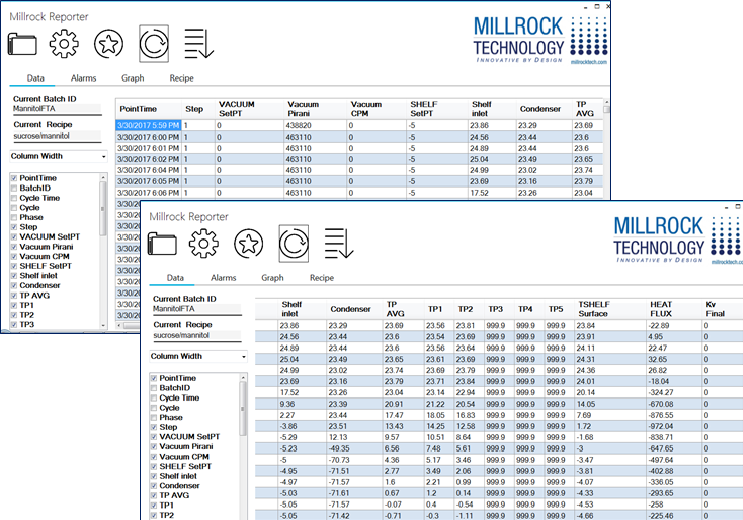 Millrock Reporter lets you pick and chose which parameters you want to see and will provide the information in either an alpha-numeric format or graph format. Want a different view, simply click another column entry or drag and drop columns of data where you would like them to appear. This system also allows you to download and print out the recipe screen and to archive runs. Freeze dryer system alarm data collection is also included. With Millrock Reporter you can have your data as simple or as inclusive as you need and change those requirements on the fly.